Cockcrocobys come up to the sea to breed in the Summer. They can be quite harmful if disturbed. They live in the hot, drier mainland in Autum and Winter. In Summer and Spring they come to the waters edge to breed and cool down. If you have not seen one, a picture of a cockcrocoby is on the left. This animal was first seen at Casuarina Beach, in the Northern Territory at 10:30 am on the 12th September 2009 when it attcked a woman at the shore. We closed the beach and came back to the beach to studdy it in Autum to find not one was there. Someone reported seeing this creature and told us it was in the hot, dry mainlands of the Northern Territory. We have been doing research and have not quite found out how this animal formed. 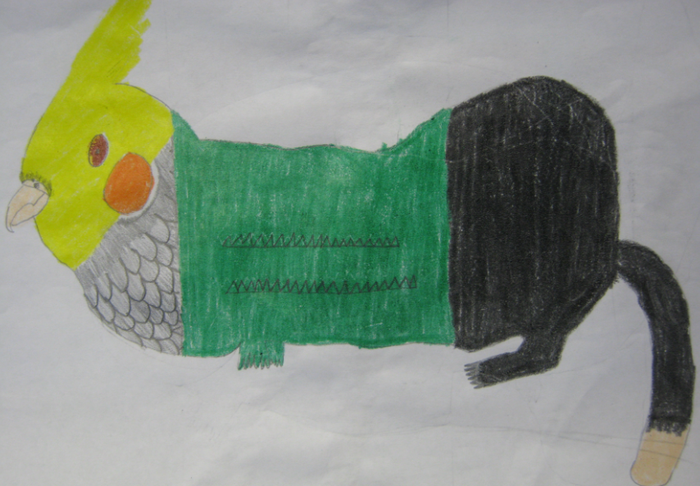 So far we think that a cockatiel mated with a bilby and adapted the crocodile's body. Below is an explanation of what happend. The cockatiel mated with the bilby. The bilby gave birth to a cockatiel/bilby at Casuarina Beach in the Northern Territory. The new animal adapted the crocodile's body so it could swim to get away from predators.